PLANET offers an ideal enterprise 8-port KVM switch solution for company server room or testing facilities. The KVM-210-08 8-port Combo KVM Switch features the patented design of the availability of USB and PS/2 interface connection, user-friendly OSD utility and daisy-chain function. 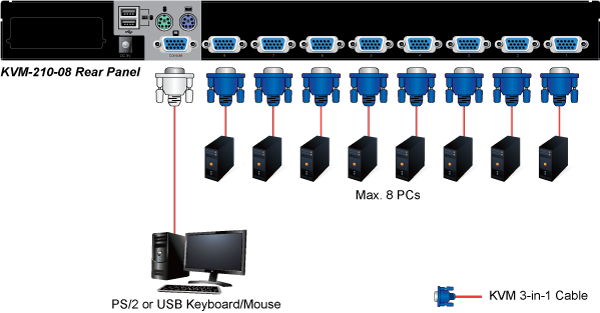 The KVM switch solution frees up more table and rack space for users in addition to saving the cost of multiple keyboards, mice and monitors. 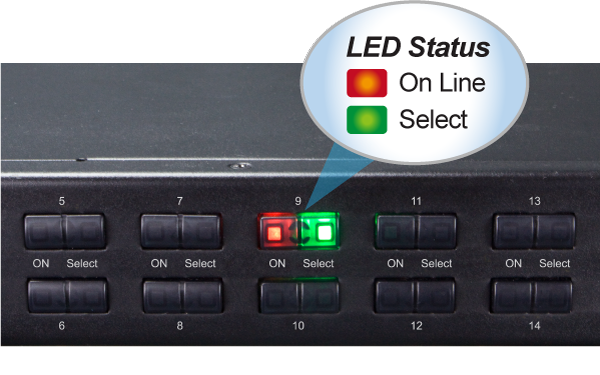 You could check the computer status on the front LED of the KVM-210-08. "Red" indicates that a computer is connected to the corresponding port and "Green" indicates that the computer connected to the corresponding port has focus. 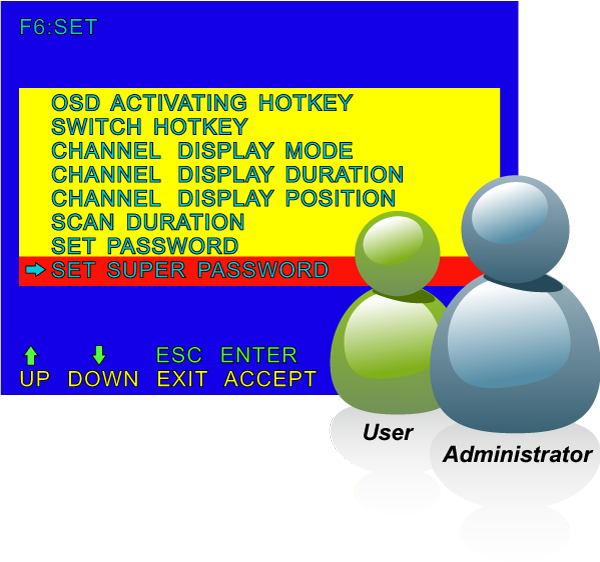 Two level password security only authorizes up to one user and an administrator with a separate profile for each user. Simply plug cables into their appropriate ports. There is no software to configure, and no incompatible problems. It works on multiple operating platforms like Windows, Linux, Mac, Sun, etc. In the present computer applications, a mouse has become an indispensable device. The KVM-210-08 fully supports all models of PS/2 mice on the market. 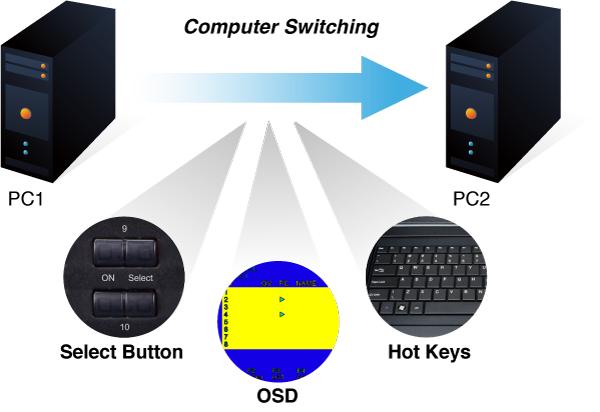 The KVM also supports the PS/2 keyboard port of code set 1/2/3 and further allows you to use the KVM for all kinds of servers, computers or their combination. The KVM-210-08 allows access and controls up to 8 computers from a single console (Keyboard, mouse and monitor). 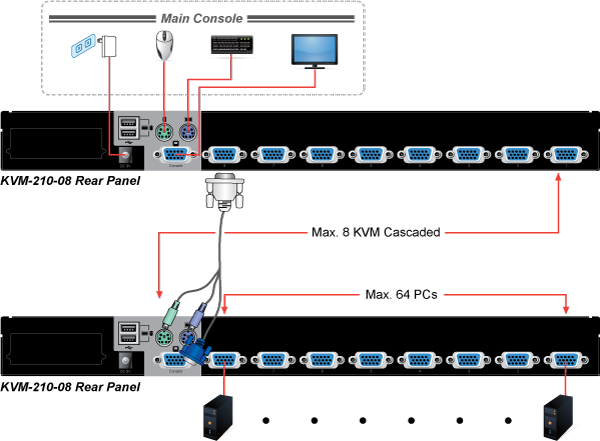 By cascading to 8 KVM switches, it can control up to 64 servers.